St. Peter’s Church has an unusual connection. The clue is in the church’s location. Wikipedia describes Woolton as ‘an affluent suburb of Liverpool’ and this might suggest something to you. Liverpool is well-known for many things, one of which exploded to fame in the early 1960s – or should I say four of them? And only one of the four was brought up in what could be described as an ‘affluent’ area – yes, John Lennon. In 1957 Lennon had a fledgling band that had a gig at a church summer fete. 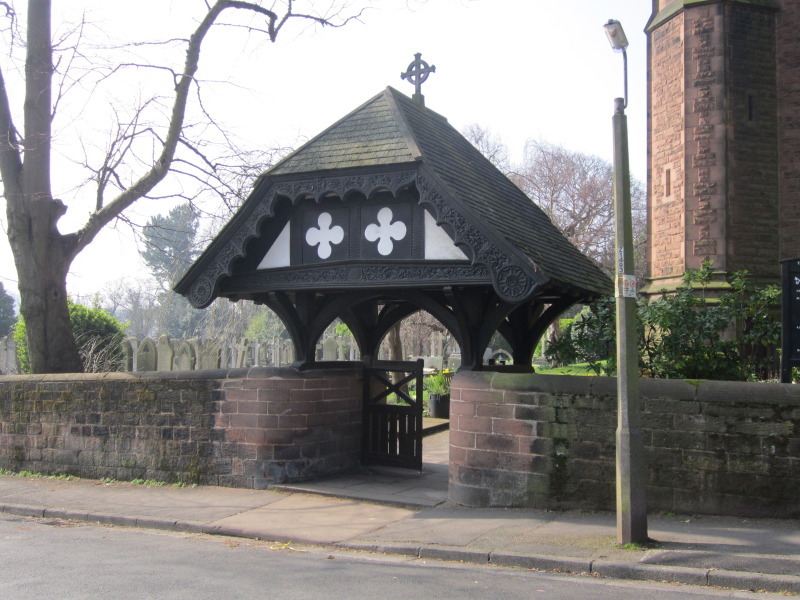 Yes, his local church, St. Peter’s in Woolton. There he met someone for the first time who would ultimately become his best friend, his working colleague, his creative partner and even his rival – Paul McCartney. John asked Paul to join his band and the rest (as they say) is history. St. Peter’s Church has another Beatles connection. In the mid-sixties, the Beatles released an album featuring a song written by McCartney. The song was Eleanor Rigby. McCartney wasn’t sure where he’d got the name from but it was pointed out to him that the name was engraved onto an old grave — in the graveyard of St. Peter’s church. 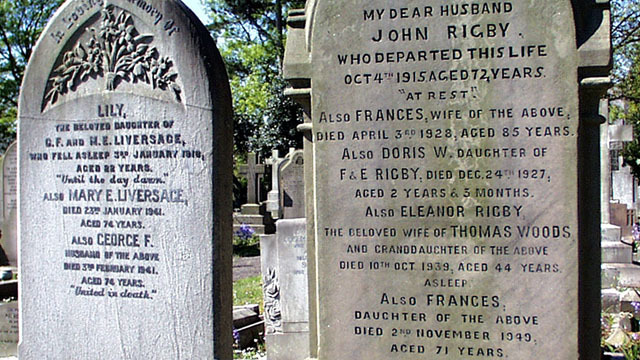 Paul McCartney said that he must have seen the grave at one time and had the name buried in his subconscious. You can see a photograph of the grave and of two other local Beatles landmarks below. 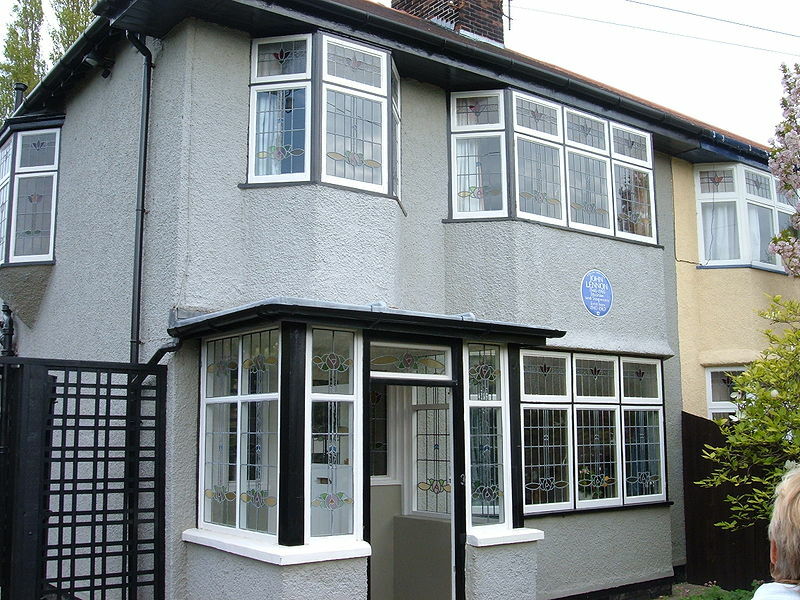 The house in the photograph is where John Lennon was brought up by his Aunt Mini and Uncle George. (Note that George is buried at St. Peter’s Church). 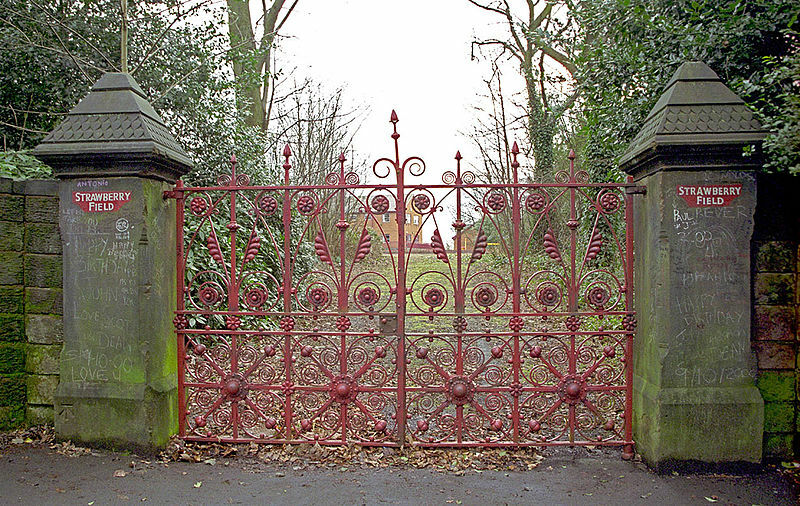 The gates are what remains of Strawberry Fields – the site of a children’s home where Lennon used to play as a boy. The three landmarks are all within a couple of miles of each other and form a convenient ‘Beatles pilgrimage’. SEE DETAILS AND REVIEWS OF GUIDED BEATLES TOURS HERE.